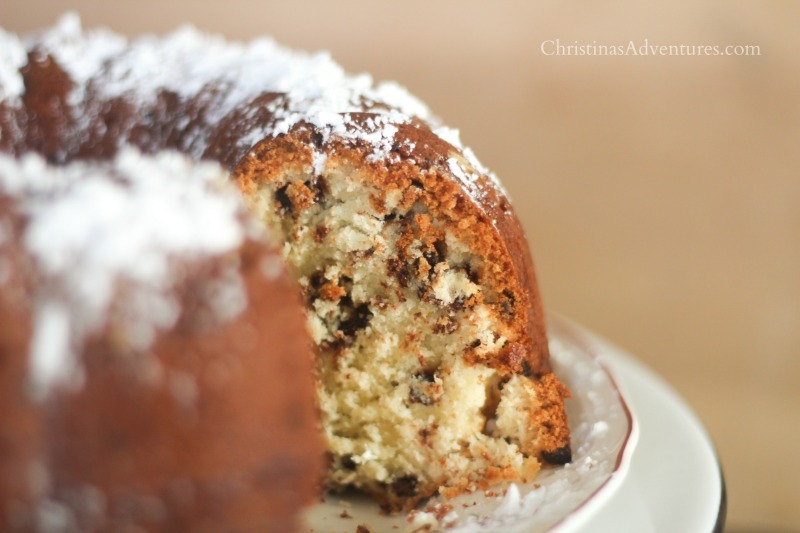 This chocolate chip pound cake recipe is one of our family’s favorites, and is a wonderful choice for Thanksgiving dessert. This post is sponsored by Keller’s Creamery butter – all opinions are always 100% my own. It’s almost Thanksgiving! Have you planned your menu yet? Even if you’re not hosting, chances are you’re going to bring a dish to wherever you’re traveling to. I vote that you offer to make dessert, and try this delicious recipe that’s been a family tradition of ours for years. We love getting together with all of our PA and NJ cousins, aunts, uncles and grandparents on Thanksgiving afternoon. We have a big loud family dinner, pool tournaments in the basement, and conversation (or post-turkey naps!) on the couch. It’s always so much fun, and as much as I enjoy the turkey dinner, I’m not ashamed to admit that I actually look forward to Thanksgiving dessert the most! This pound cake is moist, fluffy, buttery, and absolutely delicious. 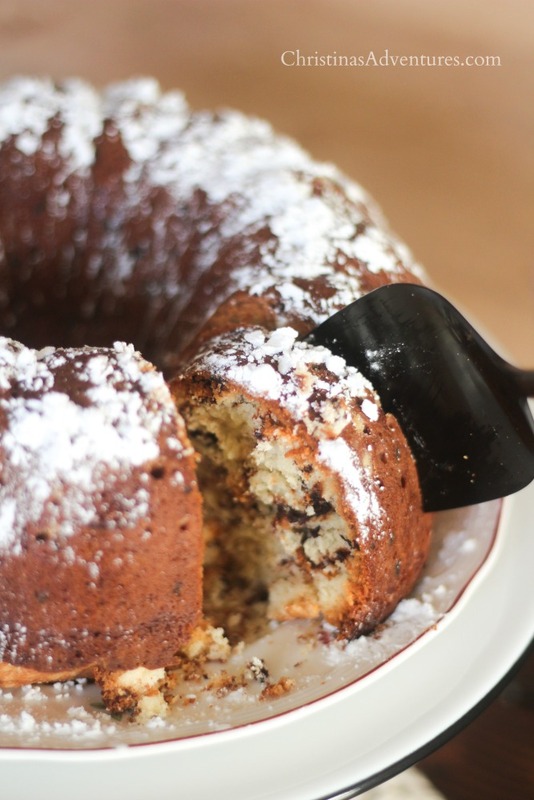 And now – the recipe for our family favorite Chocolate Chip Pound Cake. I remember eating this fresh out of the oven when I was a kid – it’s so buttery, fluffy and delicious. It will be a huge hit for your family Thanksgiving! 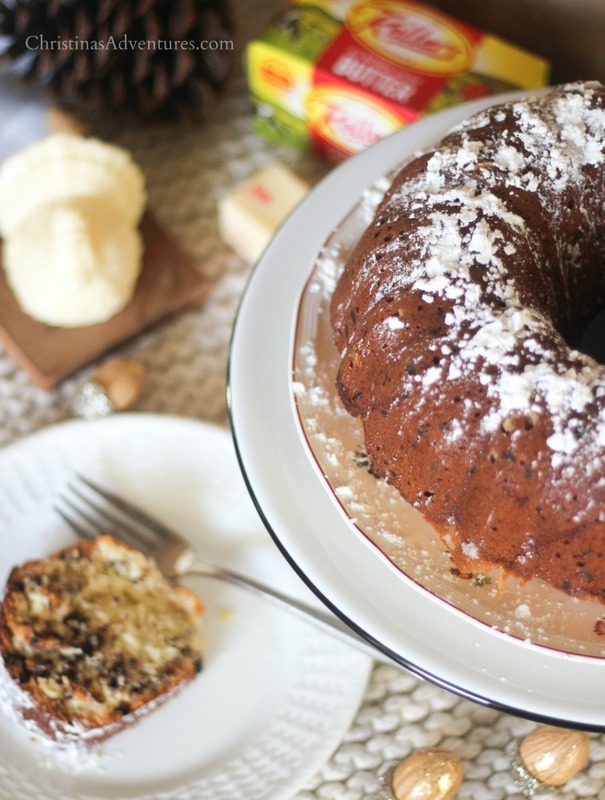 This chocolate chip pound cake recipe is one of our family's favorites, and is a wonderful choice for Thanksgiving dessert. Combine flour, baking powder, salt - set aside. In a separate bowl, beat butter, sugar & vanilla until creamy. Gradually beat in flour mixture, alternating with milk. Pour into greased & floured bundt pan. Bake for 70-80 minutes, or until a knife comes out clean when inserted. Remove from the pan, cool completely. Sprinkle with confectioner's sugar, and enjoy! Thanks again to Keller’s butter for sponsoring this post. This sounds so good christina! I love chocolate chip anything! Wow! This looks so good! Thanks for the recipe! This looks so good, I think I’ll make it for the holidays! Wonderful! So glad you’re going to make it – hope you enjoy it as much as we do! I love your recipe. Eggs,milk and chocolate is my kind of food. I made this cake and brought it over to a friend’s house as a housewarming gift – they absolutely loved it! In fact, her husband and oldest son were fighting over the last slice. The best thing about it is that it’s so easy to make. I used mini semi-sweet chocolate chips and vanilla pudding – it worked great. The mini chips didn’t sink down to the bottom. So sweet of you to let me know, Elizabeth!! Thank you! So glad you guys loved it – what a kind housewarming gift! !